No more worrying about the hotel before you get there – Holiday Inn delivers quality accommodation you’ll recommend to anyone who’ll listen. You’ll be treated to dependable, affordable accommodation worldwide. Whether for business or pleasure, their award-winning service and fabulous facilities will make you never want to leave. Enjoy a world within your reach with their incredibly generous offers, discounts and advice – making sure you don’t get left behind. Sign up to the Holiday Inn – Express eNewsletter here. 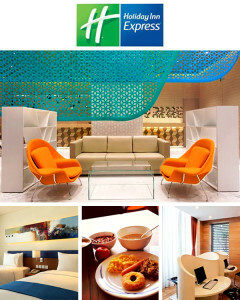 Sign up to the Holiday Inn eNewsletter here. Do you want to experience the best round of golf imaginable? Now you can. No fuss, no exceptions, no compromise. Destination Golf have turned playing golf into a luxury holiday. With their tailored packages and spectacular locations, you can now feel like a superstar every time you tee off. Play golf to the stunning backdrops of South Africa, Florida or the USA at large and see how your game improves. And when you’re safe in the knowledge that you always have a sensational hotel, dinner, activity or night out to look forward to, winning or losing won’t even matter. Their destination specialists are dedicated to customising a holiday that is focused purely on your needs. Do you have a special occasion coming up? Do you want to treat a loved one to something special? Or maybe enjoy the company of friends on the course? Whatever you expect from a (golfing) holiday, Destination Golf will deliver a hole-in-one every time. Cheesy maybe, but true. Thousands of satisfied customers return year after year to enjoy a luxurious choice of jaw-dropping hotels and hand-picked courses. And as you can even tag on extra activities, travel options and special extras, you can make either the golf or the holiday that little bit more special. Whether you’re a pro, an amateur or you fancy an unforgettable holiday with a difference, feel like a celebrity and tee off in style. Click here to request your Destination Golf Florida, USA and South Africa brochure now. Driveline Golf offer a selection of charming overseas golf holidays, each selected to appeal according to your level of ability, be it scratch golfer or beginner. Apart from the fact that they are a specialist golf tour operator their secret is to give you all the options for booking your golf holiday or golfing short break. This means you get a golf holiday bargain. And they know there is a big difference between cheap golf holidays which are often sub-standard and a discount golf holiday – a genuine bargain that would normally cost significantly more. Importantly, unlike many other golf tour operators, they do not ask you to pay anything until your holiday hotel and green fees are booked and you are happy with all the arrangements. So there is no risk for you. Some of the hotels’ golf courses that make up the collection of golf holidays will probably be recognised as household names; others are not so well known and hitherto have remained a secret to all but a lucky few. Rest assured they have seen all those that have been included and if they were not up to scratch, they would not be on offer. Furthermore they continue to look for new, emerging golf holidays destinations to ensure you have the best choice available at the best price. Driveline Golf have been awarded ‘Best Golf Tour Operator’ by Eurotunnel and have been chosen by the Daily Telegraph to supply golf holidays to members of their National Golf Network. Driveline Golf is a fully bonded license holder of the Civil Aviation Authority (CAA), Air Travel Organisers License 6229. In addition they are also members of the International Association of Golf Tour Operators (IAGTO) and Association of British Travel Agents (ABTA) W7176. In short, when you book with Driveline Golf, your money is safe. Lagrange, the self-catering specialists to France, are pleased to present their brochure for summer 2012 – France Lagrange 2012. France Lagrange 2012 features properties across the French coasts, countryside and mountains. Whether you are looking for an apartment on the Cote d’Azur, a holiday home in the Loire Valley, or a villa with private pool in Provence, you can be sure that France Lagrange 2012 will have something for you. All of the properties featured in the brochure can be booked as accommodation only, leaving you free to arrange your own transport. Lagrange can also arrange self-drive (with ferry or Eurotunnel crossing) and rail packages, helping to make organising your holiday just that bit easier. Book early and make the most of some fantastic money-saving deals – up to 20% off in some cases and many including school holiday dates! They have an even bigger range of accommodation that is available via their website. At Serenity Holidays – Great Escapes they have been arranging short breaks for over 30 years and remain successful thanks to the personal service they offer, the knowledge of our experienced staff and the excellent value of their short breaks. Great Escapes is also fully bonded by AITO and ABTA so your money is always safe. *Breaks with free nights have to be completed within the date bands specified at selected hotels. Some have compulsory breakfast and/or dinner where indicated.